The NBA on TNT will feature a Martin Luther King, Jr. Day tripleheader highlighted by an NBA Finals rematch between the Golden State Warriors and Cleveland Cavaliers at 8 p.m. ET, with play-by-play announcer Marv Albert, analyst Chris Webber and reporter Kristen Ledlow on the call. In the network's nightcap, Chris Paul will face his former team when the Houston Rockets visit the LA Clippers and DeAndre Jordan at 10:30 p.m. Kevin Harlan (play-by-play), Reggie Miller (analyst) and reporter David Aldridge will provide commentary for Rockets/Clippers. The network's pregame coverage will begin at 5 p.m. and include a special sit-down interview with Dr. Bernice A. King and Ambassador Attallah Shabazz, the daughters of civil rights pioneers Martin Luther King, Jr. and Malcolm X, conducted by Isiah Thomas 50 years after the assassination of Martin Luther King, Jr. Game action will tip-off with the Memphis Grizzlies hosting the Los Angeles Lakers at 5:30 p.m. Brian Anderson will be joined by analyst Grant Hill and reporter Ros Gold-Onwude for Lakers/Grizzlies. 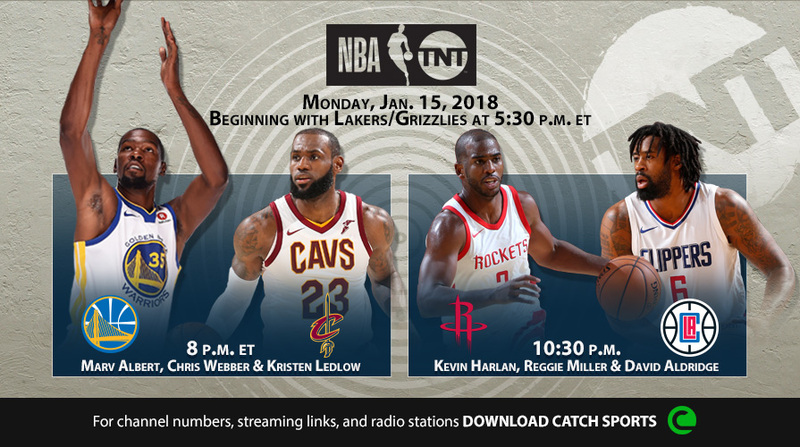 This week's NBA on TNT Thursday doubleheader (Jan. 11) will feature the Cavaliers and LeBron James visiting the Toronto Raptors and DeMar DeRozan at 8 p.m. ET, followed by the San Antonio Spurs and Kawhi Leonard taking on the Lakers and Brandon Ingram at 10:30 p.m. Studio coverage throughout the night – featuring Ernie Johnson, Charles Barkley, Kenny Smith and Shaquille O'Neal – will originate live from CES in Las Vegas beginning with a one-hour TNT NBA Tip-Off at 7 p.m.
• Kevin Garnett will add his unique perspective on the game alongside six-time NBA All-Star Amar'e Stoudemire, No. 1 overall selection in the 2000 NBA Draft Kenyon Martin and 16-year NBA veterans Rashard Lewis and Al Harrington in Area 21 throughout Thursday night on TNT, Facebook and Twitter. • Harlan (play-by-play), Miller (analyst) & LaForce (reporter) will call the Cavaliers vs. Raptors telecast on Thursday at 8 p.m.
• Anderson will provide play-by-play for Spurs vs. Lakers with analyst Greg Anthony and reporter Gold-Onwude at 10:30 p.m.